Having a Princess party in or around Chicago? 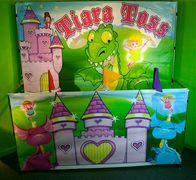 You have to have our Princess Tiara Toss Game!! This colorful backdrop game is complete with a Pink/Purple Castle, Friendly Dragons & Sparkling Fairies. Test your Princess "skills" by tossing the tiaras around the colorful flags...Get a Princess Tiara around any flag & you win!! Imagine how excited your little Princess will be when one of her tiaras makes it onto one of the colorful flags. This Princess game would make a great addition to a Princess party, Princess & Pirates party, Sophia the 1st, Little Mermaid, Beauty & the Best, Cinderella, Princess & the Frog or Snow White party.